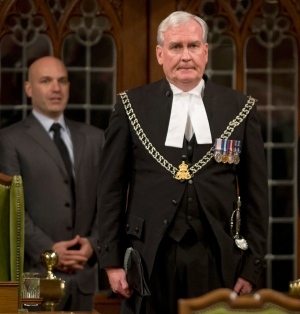 Kevin Vickers, Canada Parliament’s Sergeant-At-Arms, A Genuine Hero. It is the critical moment of the attack on the Canadian Parliament. Before any more lives could be taken by gunman Michael Zehaf-Bibeau, he is shot dead by House of Commons Sergeant-at-Arms Kevin Vickers. Zehaf-Bibeau had exchanged gunshots with parliamentary security at the entrance of Centre Block and ran down the long Hall of Honour towards the doors to the Parliamentary Library. As he ran down the hall, pursued by RCMP officers, he passed the barricaded doors on his left, behind which the prime minister and the Conservative MPs were meeting. On his right, the doors to another caucus room where NDP MPs were diving for cover. He shot at both doors, with one bullet penetrating the outer doors to the NDP caucus room. Zehaf-Bibeau continued down the hall toward the wooden doors of the Library of Parliament, where he lodged himself behind a stone pillar beside an alcove to the right of the library’s entrance. Vickers’ office is around the corner, a few metres away. Hearing gunshots, Vickers grabbed his side arm, a semi-automatic pistol, and immediately ran out. His security team, who had been chasing Bibeau, yelled to Vickers that the suspect was hiding in the alcove. Vickers immediately ran behind the other side of the pillar. That put him an arm’s-length away from Bibeau. According to guards, Vickers actually could see the barrel of Bibeau’s gun pointing out, a foot away. In one motion, sources told CBC News he dove to the floor around the pillar, at the feet of Bibeau, turning on his back as he landed and simultaneously firing his weapon upwards at Bibeau. Bibeau was hit multiple times and fell to the ground. Vickers kept firing, emptying his entire magazine. As soon as Bibeau dropped, the rest of the security team sprinted forward and opened fire. Several bullet holes in the walls in the alcove give a sense of the numbers of rounds fired, and many more hit Bibeau. One bullet passed right through the wooden library doors, hitting the librarians’ desk deep inside. But no one else was injured in that final exchange of gunfire. According to sources, Vickers calmly got up after the firing was over and went back to his office to reload his gun in case a threat remained. He then went to the Conservative caucus room where Prime Minister Stephen Harper and his MPs had barricaded the room’s doors with chairs. “I engaged the suspect and the suspect is deceased”, he said. According to sources, the entire room erupted in cheers, as Vickers left to continue to secure the grounds. « Gang Abuse Of Individuals. Shame On Britain. Interesting it’s not mention that Zehaf-Bibeau was a serial cannabis user. As were Michael Adebolajo, Michael Adebowale, Anders Breivik and Jared Loughner. Seeing a pattern?